Per copyright laws this article has been republished verbatim with attribution from its original source or internet link, which may or may not be active. For the most recent and accurate information, please use our Visit/Contact Us link. Toccoa Falls College celebrates the opening of the Leon and Rachel Gathany Museum of Natural History. 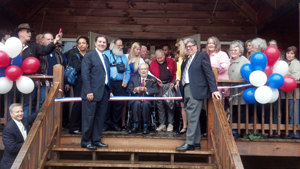 The school held a ribbon cutting and dedication ceremony Saturday at the museum on the Toccoa Falls College campus. Toccoa Falls College President Dr. Robert Myers said it was a pleasure to celebrate the museum’s opening, despite the rain that fell Saturday morning. Toccoa Mayor David Austin also spoke at Saturday’s ceremony. He said the museum is a long time coming and will be a wonderful addition to the college and the community. “A lot of blood, sweat, tears, prayers, and fundraising went in over the years to make this possible and it is altogether fitting that this is located here at Toccoa Falls College, where you spent so many years,” said Austin. School officials said the museum was ten years in the making from when the plans were first made. Gathany said he is excited to see the museum come to fruition. “I am so thankful for all of the people who have done so many things to make this place what it is today and I am torn between crying and shouting,” said Gathany. Gathany said Toccoa Falls College is a natural place for the museum to be located considering that he is a TFC graduate and also considering the number of years he spent at Toccoa Falls as an educator. In addition to unveiling the museum Saturday, Dr. Myers presented Gathany with a special presidential commendation from the college. The Leon and Rachel Gathany Museum of Natural History is located by the Gate Cottage Restaurant on the Toccoa Falls College campus. It is open on weekends, as well as by appointment on weekdays. Note: Since this article was published the Museum schedule has changed. The Foundation requests that you schedule a tour by clicking here on our –> Visit/Contact Us link to arrange a tour with a trained docent, who will ensure that your visit will be both educational and enjoyable.